Ferdinand Gregorovius was born in 1821 in Neidenburg a town in Eastern Prussia. He studied theology and philosophy in Konigsberg and became a teacher and a writer for the local paper. In 1852 he made his first trip to Italy and he started researching the history of Rome after the fall of the Roman Empire. His studies were finalized in 1872 by publishing the History of the City of Rome in the Middle Ages (8 vol. ), which is still today regarded as a fundamental text by modern historians. His fame however came from the accounts he made of various sites of Italy in Wanderjahre in Italien (Italian Walks). Many accounts cover walks or rides he made in the environs of Rome. Gregorovius was especially fond of Campagna di Roma the countryside around and south of Rome: because of his interest for medieval Rome he was attracted by the little towns which had seen the fights between the popes and the emperors/barons/Angevins in the XIIIth and XIVth centuries. Most of his accounts were written between 1853 and 1860, in the last years of the Papal State. 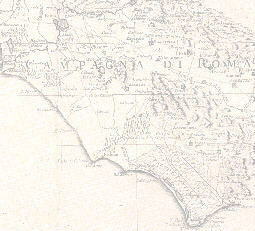 The map above was printed in 1863 and it shows the southern border of the Papal state. 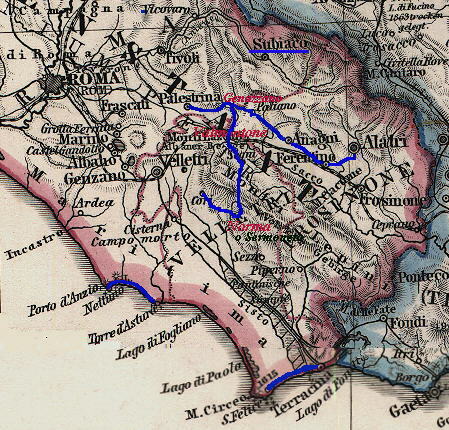 The blue lines show the itineraries of Gregorovius' walks you can find in this website. The pages give a short summary of Gregorovius' account together with pictures showing the main monuments. See my Home Page on Baroque Rome or my Home Page on Rome in the footsteps of an XVIIIth century traveller.